Like so many of the great RPGs in the gaming world, The Elder Scrolls series is one of the most in-depth and consuming sagas of entertainment that money can buy. 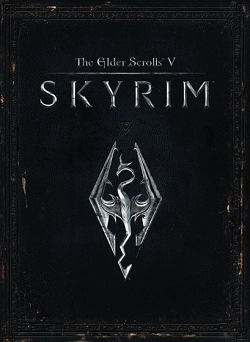 On the fateful day of November 11, 2011, Bethesda Studios rocked the gaming world with the fifth installment in the series, known simply as Skyrim. The predecessor of Skyrim, The Elder Scrolls IV: Oblivion, was the reason why I purchased an Xbox 360, and was to me, at that time, the best and brightest example of what the newest generation of games should be like. I had never before played a game that was so open, with so much freedom, and that was possessed of a beauty I had rarely seen in actively rendered gameplay. And while it may not have had the deepest or most moving story in RPG history, Oblivion effectively ended my obsession with JRPGs, and spoiled me on the trappings and style of Western RPGs. The final nails in the coffin of JRPG dominance came to me in the forms of Mass Effect and Dragon Age, but the foundation of my love for those titles was laid down by Oblivion. I say all of that to say that when the time finally came at last for the fifth Elder Scrolls game to release, my excitement was fevered. That’s not to say that I no longer appreciate JRPGs. I still love the ones who have always been close to my heart, such as Final Fantasy and Chrono Trigger, and I still think Lost Odyssey is among the most beautiful and well-written games that I have ever played. But my patience for the grind and repetition of turn-based RPG gameplay had been worn pretty thin by the time Oblivion was released. Experiencing the depth of an RPG but with a real-time combat system was immensely gratifying to me. It’s not that I am one of those players who needs everything to be action packed constantly, nor do I get bored with talking and exploring. I just enjoy being able to control my character or characters in real time, and to be able to rely more on my own skill as a gamer rather than the luck of a dice roll. Oblivion, of course, for all of its wonderful achievements, was definitely not a perfect game, and especially now, it’s easy to see the glaring problems which plague the game on a technical level, and in aspects of gameplay as well. I knew that Bethesda Studios had spent years working on Skyrim, and felt confident that the long wait would mean that many of the issues present in the last game would not carry over to this one. And plus, we were doing to get to fight dragons! Frakking dragons! So how did the fifth chapter of The Elder Scrolls saga ultimately fare? Skyrim is of course, set in the rich Elder Scrolls universe, which is one of the most painstakingly detailed fantasy settings that I have ever seen. Bethesda’s team of writers have, with each installment, enriched and deepened the world of Tamriel and its accompanying realms. There is so much lore, history, and depth in these fictional cultures, among which are great array of races, deities and demons alike. While it is true that some of these are derivative of existing fantasy or real-world archetypes, The Elder Scrolls universe has evolved enough over time to feel less like a Dungeons & Dragons variant, and more like its own distinct entity. In particular, the realm of Skyrim, and its native people, the Nords, does channel a lot of influence from the Vikings and Norse nations of our world, but has enough of its own flavor to not feel directly lifted. 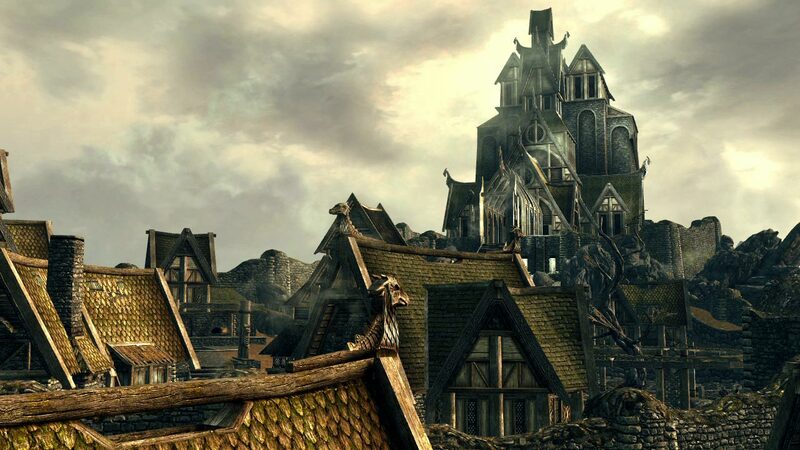 Skyrim’s stories take place 200 years after the principal events of The Elder Scrolls IV: Oblivion (the latter of which are referred to in-game as The Oblivion Crisis). In keeping with their Elder Scrolls tradition of not alienating player choice in the stories, Bethesda kept all but the most basic details about the aftermath of Oblivion obscured. This means that the exact canon of what took place, other than the broadest details, are still left up to the player. The player is left to decide how exactly their story pans out. The same is true of Skyrim. More than ever, the player is given the choice of how they play the game, and how they advance their own story. The “main” story of Skyrim, which revolves around the Dragonborn prophecy, is an interesting tale, though it is in no danger of outdoing stories such as Mass Effect, Star Wars: Knights of the Old Republic, Chrono Trigger, etc. The simplicity is actually the greatest strength of Skyrim’s tale, as the open world gameplay and choices made by the player, allow one’s imagination to customize the experience. Skyrim essentially provides a beautiful canvas upon which players can paint just about anything they want. The writing and characterizations of NPCs can be hit or miss, but are almost always at least competent, and the struggle in the main quest is sufficiently epic. I finished the primary story arc as a very satisfied gamer, yet with enough hunger left to continue exploring the other questlines that the game had to offer. One area where Oblivion has definitely not aged well is in its gameplay. Today it feels stiff and counter-intuitive. It is by no means atrocious, but especially now compared to Skyrim, it is pretty rough. Skyrim, played in first-person as it was meant to be, feels very smooth, and has taken cues from Bethesda’s own Fallout 3 as well as games such as Bioshock, with its new, streamlined inventory management and smoothed out controls. “Streamlined” is a demonized term in gaming, especially when it comes to RPGs, and for good reason. Typically when a developer says that it is streamlining a game, it really means that the game is being dumbed down and simplified, so that it can appeal to the lowest common denominator. However, in Skyrim’s case, what Bethesda accomplished is a legitimate cleaning up and smoothing out of their game’s controls and interface. The menus are an absolute breeze to navigate, inventory management is effortless, and managing weapons, powers, and spells is easy and intuitive. The user interface itself, is clean, simple, and efficient, without feeling dumb or hand-holding. Aside from sneaking, gameplay in third person mode is still a bit clunky, but for those players who prefer third person, this game works way better in that regard than Oblivion. In first person, Skyrim‘s combat runs smoothly, with a great control scheme, intense, challenging encounters, and the welcome addition of slow motion finishers in the vein of Fallout 3. Magic is also a breeze to use, especially when you wield a spell and a weapon at the same time in the style of Bioshock. The melee combat, specifically, still feels a bit floaty (sometimes enemies react to a hit the way you would expect them to, other times they just stand still with no reaction), but is usually intense and exciting. 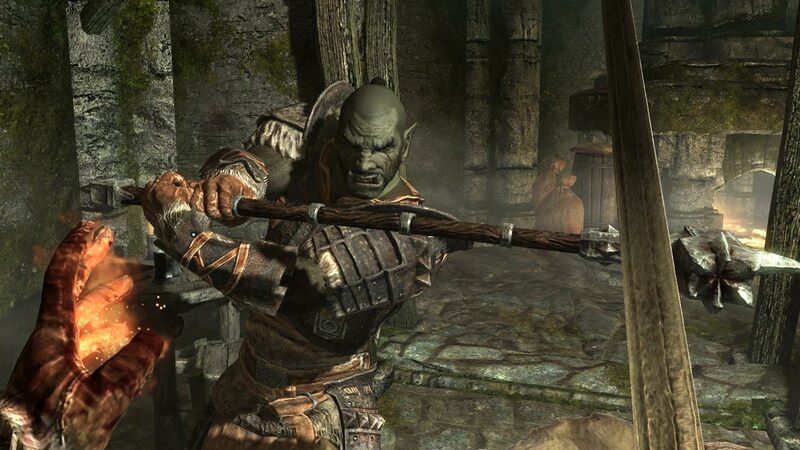 The only major wrinkles in Skyrim’s gameplay are performance issues and glitches. Sometimes, for the lack of a better term, the game just freaks out. Characters will clip through walls and objects, and the ragdoll physics can go haywire. Occasionally quests become bugged and can’t be completed. I have experienced occasional freezing, and loading times can get taxing. However, given the size and complexity of Skyrim, it is easier to overlook these problems, unlike a game such as Fable: Anniversary, where these sorts of issues are more common and much more unforgivable. I have logged several hundred hours of Skyrim gameplay, and have only encountered a couple of game-breaking glitches. But because Skyrim has an excellent manual save system, and a great autosave backup, these issues have never set me back very far. While generally speaking, Skyrim’s art direction and visuals have been well-received, there have been some naysayers. Graphics snobs, who, I’m not very sorry to say, are mostly PC gamers, were quick to snub Skyrim’s visuals. “The textures are grainy,” “the resolution isn’t high enough,” and, “there isn’t enough detail,” are just some of the complaints that I have read other critics give this game. To that, I not only scratch my head, but am also tempted to suggest that they remove their cranium from a certain other part of their anatomy. Skyrim may not be the most extraordinarily detailed, photo-realistic, or highest resolution game on the market, but I’ll be damned if it isn’t still a beautiful and wonderfully immersive gaming realm. As a gamer who actually does, well, go outdoors, I can appreciate how lifelike the creek beds, rock faces, waterfalls, marshes, and snowfields of Skyrim are. The vistas, views, the auroras, the beasts, and the storms you experience in this game are wonderfully alive. NPCs may not be perfect (certainly not L.A. Noire quality) but are mostly well rendered and believable. Special effects and spells look awesome. The lighting and ambiance in this game are among the best that I have experienced in an RPG. So while yes, around the time of Skyrim’s release, and certainly in the years since, there were and continue to be games that are more detailed and more appealing to graphics snobs. But the beauty and majesty of Elder Scrolls V won’t be overlooked by this gamer. 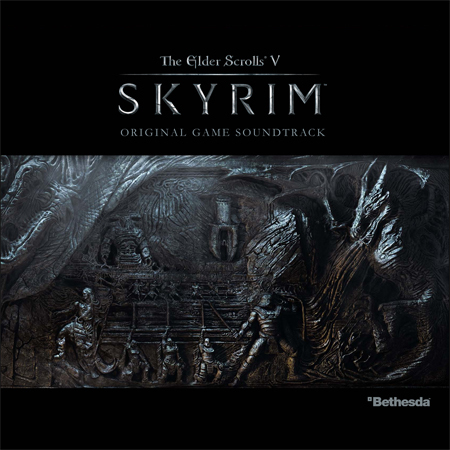 Skyrim has a beautiful soundtrack, with many quiet, beautiful, more atmospheric and folk-like tracks, contrasted by full blown, epic, bombastic, orchestral fantasy music. The main theme, “Dragonborn,” was recorded with a 30-person choir, who sang there parts in three tracks, thus providing 90 voices to the powerful track. The tracks, “One They Fear” and “Watch the Skies,” play whenever a dragon is around, and these epic compositions will quickly become familiar to players. The music is quite excellent overall, and the sound effects are of great quality. The effects have the appropriate weight when they are needed (such as when you are fighting dragons) and the ambiance, especially of nature, is great. However, one complaint that I do need to register is with the voiceovers. The voice acting is mostly quite good, or at least competent, but like Oblivion, repetition is an issue. Oblivion had only a total of 13 voice actors, and there were entire races of Tamriel who were represented with just one voice. Skyrim is not as offensive in this regard, and does have more variety, but there are still far, far too many instances where you hear the same voice actor over and over. As an example, the first NPC you ever meet, Ralof, is voiced by Michael Gough. Michael also provided the voice for 62 other Skyrim NPCs, so it is a little bit immersion breaking to hear the same voice, even when it is well-performed, for so many different characters. 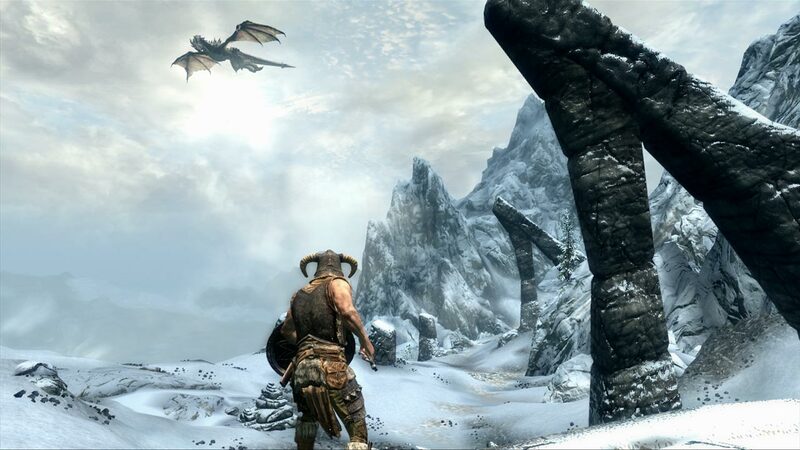 Skyrim has three add-ons available for download, which are also included with the Legendary edition of the game: Dawnguard, Hearthfire, and Dragonborn. Dawnguard, was interesting in concept for me but I found the actual content to be underwhelming. It adds a few new areas of the game to explore, including a previously unexplored plane of Oblivion, the Soul Cairn, new weapons, and new factions. It also provides lots of improvements and new options for players who have werewolf or vampire characters. These are all welcome additions, but I just found the questlines themselves to be pretty uninteresting. Becoming a vampire hunter or a vampire lord just felt a bit flat compared to the other faction quests, and the story also follows a surprisingly similar path regardless of which side of the war you choose. Perhaps I just set my expectations too high for Dawnguard. Hearthfire is a smaller add-on. It adds the ability for the player to buy his or her own land, as well as the chance to custom build a home on said land. Also, this module lets players adopt children of their own. This is all pretty cool, and I welcome the addition of these features, but I do feel like that it could, and probably should, have just been included as a part of a larger add-on. Also, while I did get a lot of enjoyment out of building a house, I suspect that most players’ houses will look very similar, if not identical, to each other. A little more customization and personalization would have been nice here, but as-is it is still a fun addition to Skyrim’s gameplay. 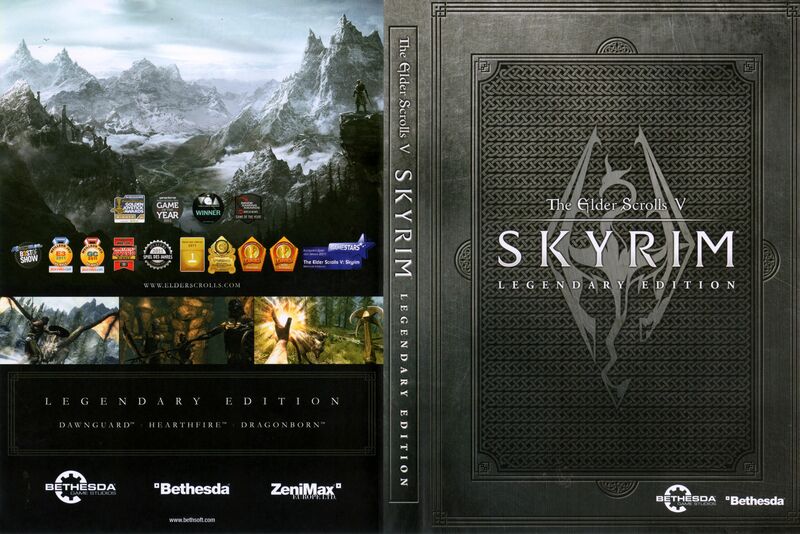 Dragonborn is the third and final expansion for Skyrim, and fittingly, it is the largest and most elaborate. It takes place in a wholly separate area of Tamriel, an island known as Solstheim, which is a part of Morrowind. Solstheim looks and feels like a combination of the realms of Skyrim and Morrowind, with flora and fauna from both. This is especially cool for fans of The Elder Scrolls III: Morrowind, as through Solstheim we get to see a high definition update of some of that realm’s landscapes and creatures. Dragonborn was extremely satisfying and engrossing for me, as it offered some really fun new quests, awesome new Shouts (including one that lets you subdue and ride dragons! ), new materials, weapons, and armor, and a very well-imagined new area of Tamriel that is a blast to explore. This add-on also introduces Neloth, a Dunmer wizard who is one of the most fun NPCs I have ever encountered in a Bethesda RPG. Despite some occasional technical problems, and a disappointingly short run of DLC, The Elder Scrolls V: Skyrim, is still, to me, a masterpiece of the RPG genre. It is above and beyond worth the price of admission, and even after hundreds of hours invested into it, I can’t wait until the next time I play it. Years after purchasing it, I am still discovering new areas, new quests, and new Shouts to experiment with. Skyrim gets a final, overall score of A from me! Disclaimer: Images courtesy of bethsoft.com. The Elder Scrolls, Morrowind, Oblivion, Skyrim, and all related trademarks are the intellectual property of Bethesda Studios. No copyright infringement is intended. This review is for informational and entertainment purposes only.